Yesterday was May Day. May 1st is a holiday here so we had a day of play. The village "Hohenbachern", is a really idyllic spot surrounded by rolling hills and forests. It is a bit larger than Hangenham with some very nice architecture including a gracious old school house and several fine large stucco barns. There are also lots of lovely gardens. The spring bulbs and fruit trees are in full bloom now. I am particularly taken by the ancient old apple trees. They are so dark and gray and bent, when they get covered in tight little bunches of smooth pink buds and clear white flowers the effect is remarkable. Anyway, the weather was just right. Cloudless blue sky, warm sun and a cool breeze. We got to Hohenbachern at about 9 a.m. The tree was lying on the street. 35 meters long. Very large. All the branches had been taken off except for the very top bit which looked like an average Christmas Tree. The top greens were decorated with blue and white ribbons (Bavaria's State Colors) and the rest of the huge trunk was very carefully and artfully patched to present a nice smooth pole. When we got there, a large group of old and young men were gathered to mount the guild shields along the sides of the pole. Definitely a "guy" sort of thing. Lots of tool boxes and drills with all the older fellows telling the younger ones what was what. I think there were about 8 large shields for each side of the pole. After those were mounted the business of lifting the thing began. There were about 80 men. These men divided into 5 or six teams. One older man wearing a blue farm coat was the boss. On his command the teams picked up long heavy poles that were bound in sets with carefully woven heavy ropes. Each set or poles made a sort of enormous "crutch". The 6 sets of "crutches" were graduated in length from about 10 feet for the shortest set to about 40 feet for the tallest. A back hoe lifted the top of tree about 10 feet off the ground and the teams began to postion themselves with their poles. 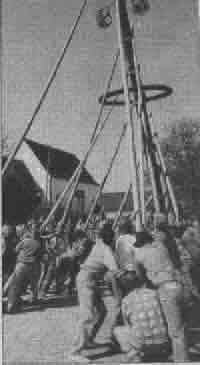 The rope sling between each set of poles was placed under the May Pole and each set of poles from short to tall spaced itself out along the lenght of the thing. On the blue coat's command the teams would push their poles slightly forward and inch the huge May pole, an inch at a time, upwards. Once a set of poles gained it's full upright position, men with poles that had great iron claws on the end would move in, hook the poles and move them forward on the May pole. 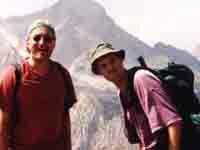 Then the process of pushing upwards would continue. After about an hour, the May Pole had risen to roughly a 35 degree angle. It took another hour of fierce pushing and loud commands "BAUM HOCH!!!" then the tree came upright amid delighted cheers and great satisfaction. By this time the street was full of children and onlookers. Once the tree was bolted and braced upright, everyone walked around a big barn building to a waiting feast of roasted chickens, sausages & beer. Delicious! The courtyard of the farm had been filled with about 30 long wooden tables. Quite a memorable morning in Bavaria. We had helped to raise a May Pole.